Did the cold open from The Office episode Todd Packer look somewhat familiar? That’s because it was filmed last season! Of course, Justice Beaver is in reference to last night’s episode of The Office episode Todd Packer, when Jim explains a prank he’d like to pull on Packer. Jim: Call Froggy 101, say that we’re the tour manager for Justin Bieber and we’re giving away free tickets. We give them a number to call for the tickets, and it’s his number. 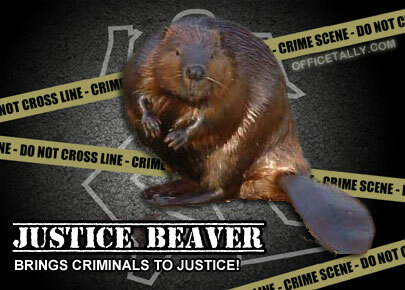 Jim: It’s a crime fighting beaver. Summary (NBC): After many years and motel rooms, Dunder Mifflin traveling salesman Todd Packer is ready to leave the road behind and take a desk job in the office. However, it remains to be seen if Jim, Dwight, Holly, and the rest of the office are ready for Todd. Elsewhere, after his computer freezes for the millionth time, Andy battles office administrator Pam for a new computer. Guest stars: Amy Ryan, David Koechner. That’s right, people. Steve Carell owns it.